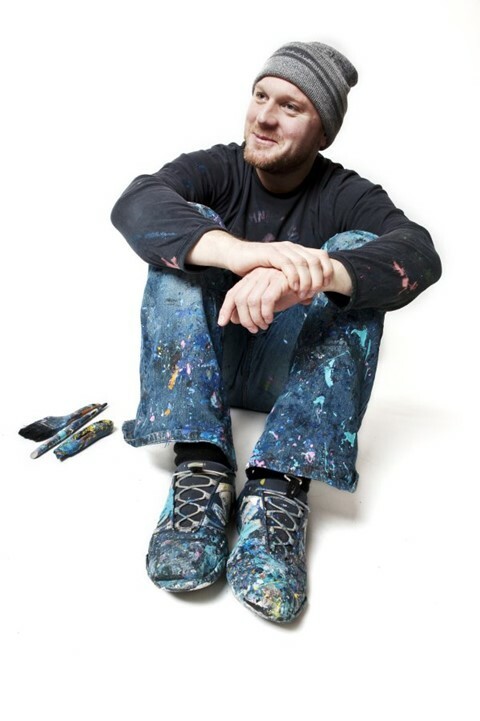 34-year-old, Essex born artist Nicolas Ruston’s colourful installations and scratch paintings are a refreshingly complex reflection of contemporary culture. His brutally vibrant works are saturated in pop culture references and revel in the iconography of mainstream media. Rather unsurprisingly his past as a senior media creative and art director, whose job included "recreating the real", has fed into his recent work in which he toys with the visual codes of mass media. DD: What is it about consumer culture that fascinates you? Nicolas Ruston: The thing that fascinates me about consumer culture is the way that our beliefs and values have increasingly become shaped by the things that we buy (or buy into) and equally how the things that we buy (or buy into) are cultivated as a response to our evolution as consumers. The media landscape is an environment that suckles us from infancy – a piece of packaging, or a jingle from an ad, can evoke as much nostalgia as a family photograph. DD: How did your time in media inform your work? Nicolas Ruston: Working in media helped me to delve into, expose and unpack the devices set up to appeal to our inner mechanics of desire. You could say my background is based on the manufacture of illusion. I have worked as an art director for film, a prop model maker and as an advertising creative. In the past I’ve been hired to produce substitutes for reality for TV, pop videos, movies and adverts – anything from creating delicious looking Nescafe coffee granules made from painted cat litter along with over-sized rubber coffee beans. Reality just isn’t good enough for HD TVs. DD: Do you feel there is a lack of perspective in our relationship to the media? Nicolas Ruston: I consider media as a landscape, an environment that exists in our head. We live inside our media. We're immersed and surrounded – and whatever surrounds, involves. I recently visited Rome. Two American girls in their mid-20s were sat in front of me on a tour bus and whenever a McDonald’s franchise sign appeared they pointed excitedly and sang the latest McDonalds jingle, they were note perfect – a requiem for Rome! DD: Which artists and writers do you find interesting in reference to your work/practice? Nicolas Ruston: Writers that are influencing my work are every newspaper columnist, magazine journalist, advertising copywriter and art theorist that I come across – I am an avid consumer! I would also say the following writers have influenced my work: Jean Baudrillard, Michel Foucault, Naomi Klein, Noam Chomsky, Will Self, Michel de Certeau, Barbara Kruger, Roland Barthes, Guy Debord, Walter Lippman and Edward Bernays. Artists that influence my work include: The Chapman Brothers, Tom Friedman, Richard Prince, Damien Hirst, Sir Peter Blake, Andy Warhol, Dash Snow, Barry Reigate and Jeff Koons. Nic Ruston will be showing a small selection of new paintings and a video presentation at The Club at The Ivy May 28 with a solo show being prepared for later this year.